I’ve been working on a novel that includes a plot line of colonizing another Earth-like planet. One of the problems that I’ve enjoyed working out has been the means for delivering large groups of colonists to the new world, known as Micasa. Initial exploratory expeditions required small groups and the ability to both land and return to orbit while the follow up colonial ships need only one-way capability. Additionally, a colonial ship must provide tools and emergency shelter for the colonists after they arrive. In my tales, we have discovered a working warp-drive system. There is a major drawback, however. The warp transit wipes out the entire nervous system of any mammal, including humans. The problem was solved by placing them into cryogenic sleep chambers called CryDox, that essentially shut down the nervous system and then restart everything after transit. The CryDox are environmentally sealed boxes about a meter and a half wide, one meter deep and three meters long. Without external power sources, they can maintain the cryogenic state for up to a couple of weeks. Since the planet Micasa is very similar to Earth, two types of colonial landers are used. The Type One is designed for a parachute-assisted vertical landing on dry land. It holds one hundred and twenty eight CryDox to be decanted after landing and four crew chambers that are decanted after warp, but prior to landing. 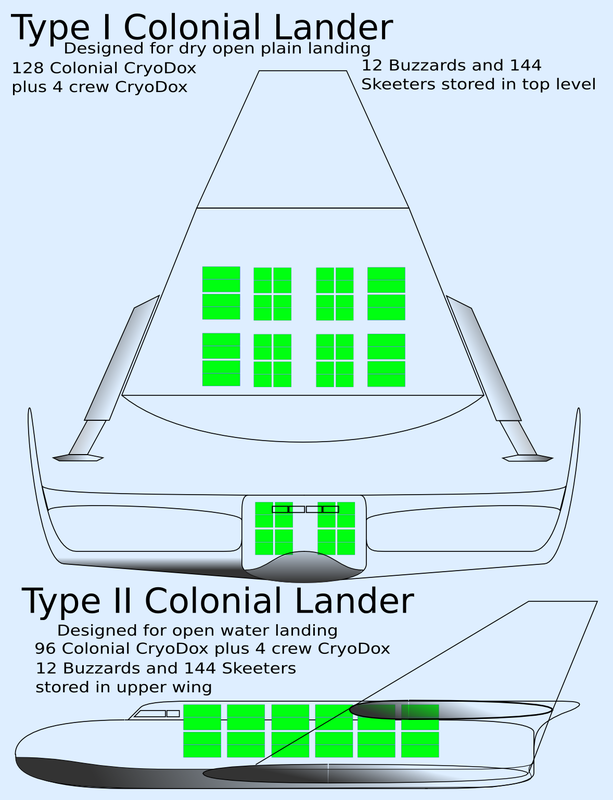 The Type Two Colonial Lander has a fuselage shaped like a much larger version of the NASA space shuttle with the addition of biplane wings and twin vertical stabilizers. It is designed with the highly-reinforced bottom hull of a seaplane. Once safely landed, the crew will beach it and unload above the high-tied mark. It holds ninety six CryDox to be decanted after final landing and four crew chambers that are decanted after warp, but prior to landing. Since these spacecraft will only be used once, they waste no space on monster main engines and fuel tanks. While in orbit, they use small thrusters for attitude control. Plasma Magnetosphere Aerobraking is used for re-entry and upper atmosphere manuvering. The Type Two lander uses normal aircraft control surfaces for final approach. In both cases, the interior of the spacecraft are disassembled to provide some of the initial building materials for the colony. After working these ideas out in my head, I decided I needed a break from being a wordsmith and fired up my favorite vector graphics program, Inkscape. The result is this simple, 2D CAD image of the two spacecraft. The green rectangles simulate CryDox. A discussion of Buzzards and Skeeters will have to wait for another post. As usual, comments and questions are welcomed.